Mix in agar-agar with celery and ginger juice. Bring mixture to a full boil and put into a container to be placed in the refrigerator. Let mixture solidify. Place solidified mixture in blender and blend till fluid. Mix all ingredients together and season with salt and black pepper to taste. 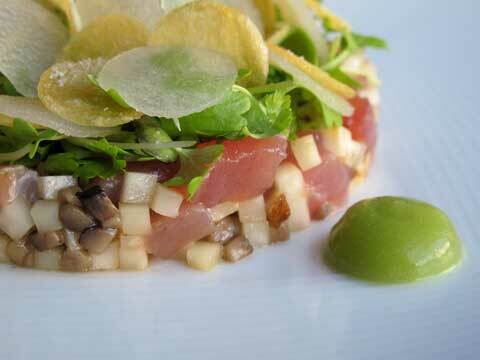 Mix tuna, celery root, Portobello with truffle soy dressing. Form into disc with ring mold. Squeeze three small dollops of celery ginger gel on top of tuna mixture. Garnish with micro celery and micro wasabi on top. micros. Drizzle a little more soy dressing over everything. Squeeze a dollop of celery ginger gel beside tuna.